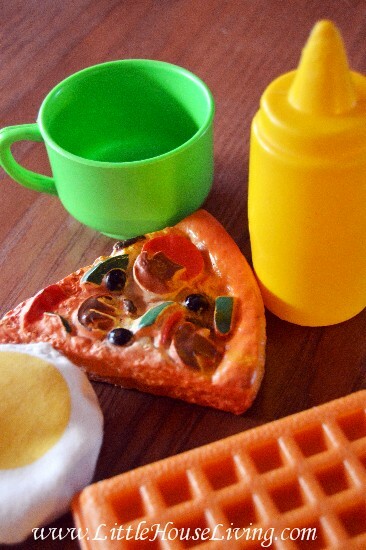 Need something to keep your little one busy on a budget? 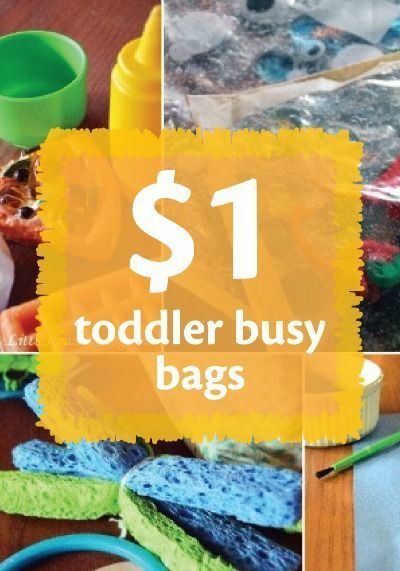 These Toddler Busy Bags can be put together for about $1 per bag! 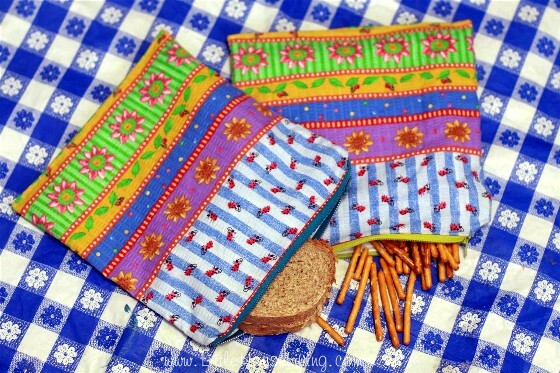 These busy bags are great to pull out when your little ones needs something to keep their hands busy. I’m bound and determined to get through the rest of this winter with my sanity intact. Living in 400sq feet with an active toddler doesn’t exactly say “peaceful household” to me. Since my little one is too young to sit and play or read quietly yet we had to come up with something fun that we can do in short bursts of activity. Enter toddler busy bags. Busy bags are small activities or special toys that you keep separate from other toys and games and you can pull them out for a “special” activity to do when you really need them. What are Toddler Busy Bags? How do you make Toddler Busy Bags? 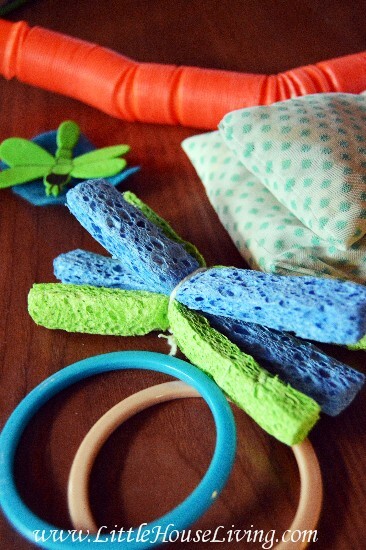 My favorite ways to get started making busy bags is to head to the dollar store and put together little things that I know my little one will love to play with. You can start creating a bag with a theme or begin putting finding fun things and then putting them together after you have everything collected. Busy bags take a little effort to put together but they are very inexpensive to make and you can make a whole cupboard full in one afternoon. Below are some of the busy bags that we’ve put together. 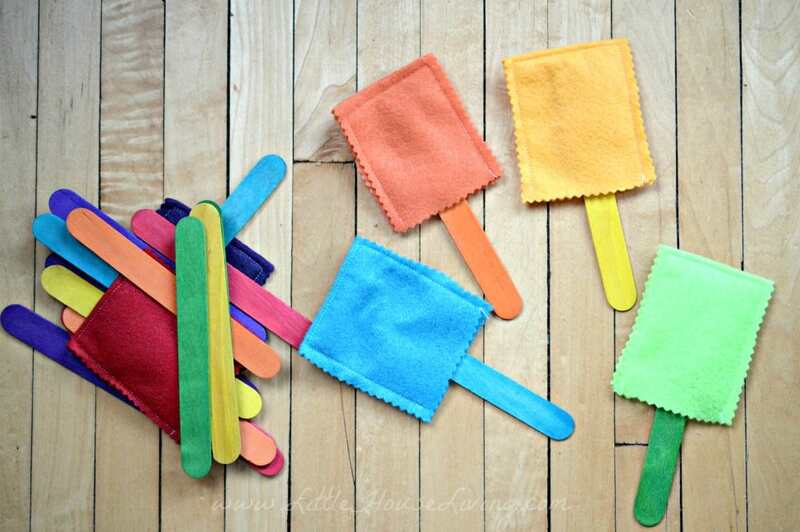 These are great for a toddler aged child that needs to have something to do while you are working on housework, homeschooling older kids, or just need a little peace and quiet moment. We get our supplies from the local dollar store. —If you have a slightly older child, check out these Busy Bags for Preschoolers. I don’t trust my littles with real paint yet when they are this small (or markers, or anything that leaves a stain after our little “crayon incident”!). This little craft is the perfect solution. They learning painting skills without making any kind of mess! 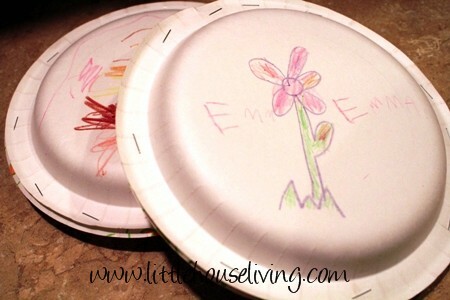 This craft can be done just about anywhere but we prefer to do it at our table. 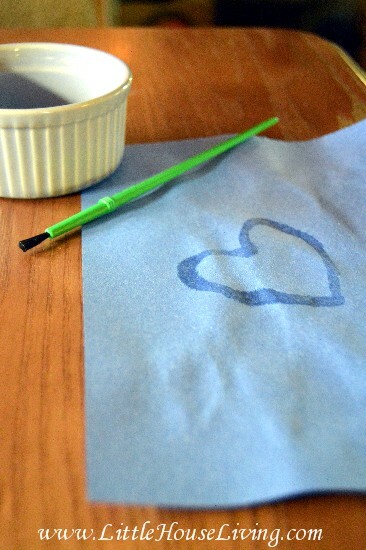 Using the water, let your little one “paint” on the construction paper. No real color is being produced of course, but it looks like a real painting when the construction paper is wet! Bonus…you can reuse the construction paper for other crafts when it dries or reuse it for a new painting session! This is one of my favorite activities because we aren’t creating a lot of paper waste. My littles love these little sensory bags, especially when they are getting a little wild and needs a slow activity to calm down. You can toss just about anything that’s not sharp in these so go all out at the dollar store coming up with fun themes! An important element in any preschool is imaginative play. We have a couple different bags filled with “real life” items that we use for play. Some of my little one’s favorites are the bags with play dishes and the bag with play food. I’ve seen these at the dollar store, and we picked our play food up at a garage sale. My littles will either play with these bags on their own or we will go through them together, and I’ll name the items as they pull them out. I really love to get out the dishes bag for them while I’m working in the kitchen so they can “work in the kitchen and bake” too! This one is always the very favorite bag! And it just happens to be the cheapest and most random one to put together! This bag is filled with random things that all over different textures like a strengthening tube, felt pieces, bean bags, sponges, and other random items we’ve collected. Everything in here is very different and they have fun pulling everything out and touching it all. This is a great busy bag for toddlers with texture and sensory issues. Those are just a few bags that we’ve put together. I know I haven’t even spent $10 on all the items in them but they keep the littles busy with activities for much of the day and I love that they are either learning art skills, life skills, or working on texture/sensory issues. These toddler busy bags just add a little more “extra” into our day instead of being bored with being stuck inside. 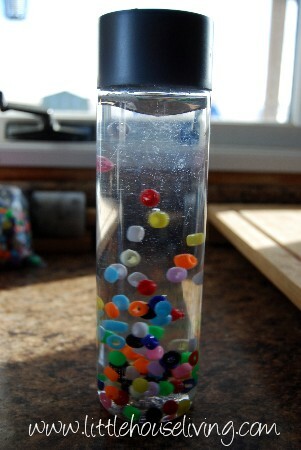 Your little one might enjoy this fun little Sensory Bottle as well! Have a little bit older children? You need to see my post on Frugal Preschool Busy Bags too. 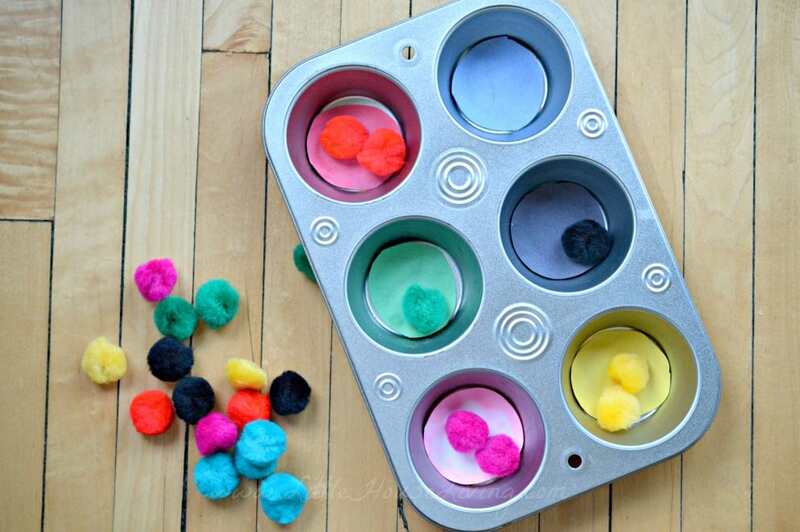 Looking for more fun DIY projects that you can make with and for your little ones? 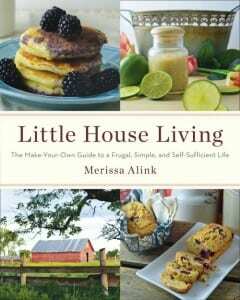 My book, Little House Living: The Make Your Own Guide to a Frugal, Simple, and Self Sufficient Life has over 130 recipes, money saving ideas, and simple living tips…including an entire chapter of kids projects and recipes! Have you ever put together toddler busy bags? What are some that you have done? This blog post about toddler busy bags was originally posted on Little House Living in January of 2014. It has been updated as of December 2018. I used to make busy bags for my sons. I too spent the time looking at the dollar store and garage sale shopping. Their favorites were either cars, animals or some kind of silly play dough. I would bring them out every time it was time to make dinner, clean the house or very famous got those rainy days. Great idea! Love these ideas. Especially love that paint water on construction paper. How easy is that?! Thank You so much for the nifty ideas, although we are city folks, we love the simple life, and find many joys in a small garden, or canning our own foods, sewing…..things that are seeming to disappear. I followed you on facebook because we seemed to have some things in common. I have my granddaughter almost everyday Mon-Fri while my son and dil are working….shes only 7 months old but some of the touch and texture things I think she would love. Thank You for the great ideas!!!! Wonderful ideas…however I would encourage picking up used items at thrift stores & garage sales (I know you do! ), I very much dislike the dollar type stores as most everything comes from China, and occasionally those items prove to be toxic, better safe than sorry. No disrespect meant, just my opinion. Agreed! We should be reducing our consumption of cheap plastic goods. The busy bag materials could be recycled materials. Wow what brilliant ideas. I am about to post on my blog about something I have made. It wasn’t super cheap as I made from all new things but take a look and see think you will like. I love your ideas! A few other things I have bought at the dollar store are a package of wooden spoons and a metal bowl. I kept the larger spoons and gave my child the small one. He loved mixing things up. Another idea not found at the dollar store but the hobby store. I bought 6 wooden eggs when they were on sale. Then I cut an egg carton in half and put them in it and I kept these with the bowl and spoon. I also kept a simple apron with these items. My son is a teenager now but all these items can still be found at our local dollar store or the hobby store an hour away. And now my 2 little grandsons play with this set. These ate such great ideas!! Will definitely starts doing the construction paper, “painting” and maybe the sensory bag. Very cool!! What great ideas!! 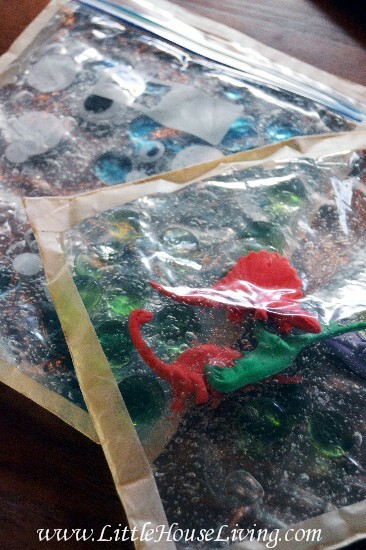 I’m definitely making those sensory bags. Pinned. II was just looking for stuff to keep my 2 yr. old busy and found your post on pintrest! great ideas! I will put them to use! thanks!! Very good ideas for active toddlers! I keep lots of craft supplies around for my grandchildren, but I haven’t ever thought about putting together busy bags. Thank you for sharing your creative ideas! I already do most of these, but hadn’t seen the sensory bags before! I will definitely be making those for my little ones! Gotta love toddlers – that wonderful age when the simple things are still fascinating to them! I had never heard of “busy bags” when my daughter was a toddler but I wish I’d had frugal ideas like these when she was that age! This is SUCH a great idea! I have a 600 sq ft house plus a lab, newborn, nad toddler, so I get your need to keep your sanity indoors! That is so cute! Makes me wish I still had little ones running around. Thanks for sharing it at the Dishing It & Digging It Link Party. Lots of fun to be bad! I especially like your “textures” bag! We loved using busy bags for my kiddos when they were little. They are perfect to bring to Dr offices, out to eat, and just to keep little ones busy when the big kids were doing school. It is amazing what you can put together for pretty cheap too! Sharing with my followers. Thanks for liking up with Inspire Me Monday! I hope you have a blessed week!! I would love for you to share this with my Recipes, Crafts, Tips and Tricks Facebook group. Hmmm…..I’m not sure how safe using hair-gel would be, especially from the dollar store. When (not if) the bag breaks or leaks, and the toddler tries to drink it (which most would out of curiosity), it would mean an instant trip to the hospital to get their stomach pumped. Maybe instead use some kind of eatable clear gelatin?